Reinforces students’ knowledge and understanding of literary discourse and provides authentic insight into how academic language works in the target language. Supports inquiry learning. Reading and interpreting literature encourages learners to be comfortable with ambiguity, engage in perspective taking and understand the human experience across cultures. Invites both teachers and students to identify themes that allow for interdisciplinary connections with history, politics and society. English-language novels like The Hunger Games, Harry Potter and the Divergent series encourage adolescents to become lifelong readers, yet finding authentic fiction in Spanish can be a challenge for middle-grade teachers of bilingual students. Here are four Spanish-language novels that are ideally suited to bilingual middle-grade readers, whether they are dual language students, English learners or heritage speakers. These novels take on issues of culture, identity, immigration and growing up as viewed through the eyes of compelling and sympathetic adolescents. Esperanza renace: Pam Muñoz Ryan’s coming-of-age novel examines the themes of privilege, circumstance and resilience through the story of Esperanza, a wealthy Mexican girl whose family loses everything due to a series of devastating events. Set in 1930s Mexico and California’s Central Valley, Esperanza struggles to redefine herself based on who she is rather than what she has. En días de muertos: Berta Hiriart offers insight into the meaning and power of The Day of the Dead, one of Mexico’s most colorful and important holidays. Tina and her family leave behind Xochiltepec for better economic opportunities in the U.S. As they struggle to adjust to life in a new country, Tina and her family face challenges to their home culture and traditions and Tina finds herself in the position of leading her family through the cultural transition. Cajas de cartón: Francisco Jiménez bases this novel, as well as its sequels Senderos fronterizos and Más allá de mí, on his own experiences as a child of Mexican immigrants who arrived to 1940s California during the bracero program. Francisco’s inspiring story of his struggles and determination to succeed and complete his education have made these novels beloved among middle-grade readers. Devolver al remitente: Julia Álvarez, a popular author of both adult and young adult novels, beautifully interweaves the stories of Tyler and Mari, whose lives cross in rural Vermont because of the economic hardships that both of their families face. Prejudice, fear and miscommunication threaten the tentative friendship of Tyler and Mari, but this pair of sympathetic protagonists transcend those challenges and support each other through the challenges of personal loss and adolescence. These four novels are just a sample of what is available for teachers working with bilingual readers. If you’d like extra resources to support the teaching of some of the books mentioned here, as well as other Spanish language novels, take a look at Sara-Elizabeth Cottrell’s e-books available on her Musicuentos website. 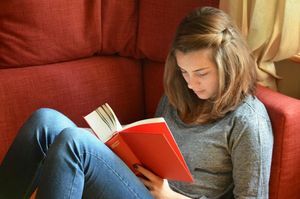 If you’re looking for more ideas of authentic fiction in Spanish, Lectorum Publications offers a large catalog that includes literature for middle-grade readers and Goodreads also offers great book recommendations. Do you have a favorite Spanish-language novel that your adolescent readers love? Post your suggestion in this discussion thread.